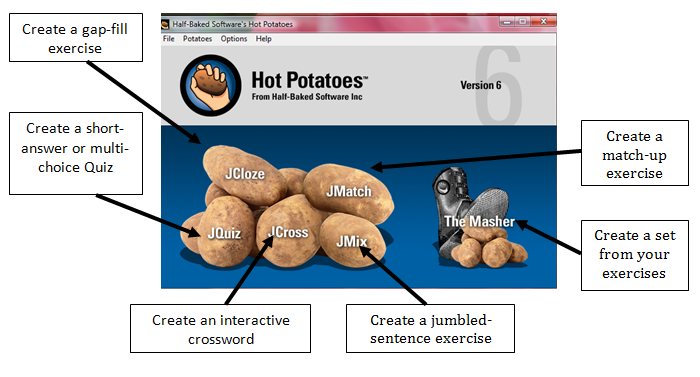 How to create interactive exercises using Hot Potatoes. Creating a drag and drop exercise. 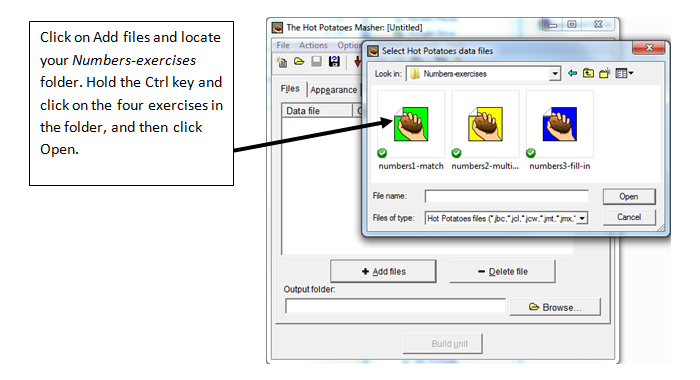 Hot Potatoes is a freely available software package which enables you to create several types of interactive online exercises. 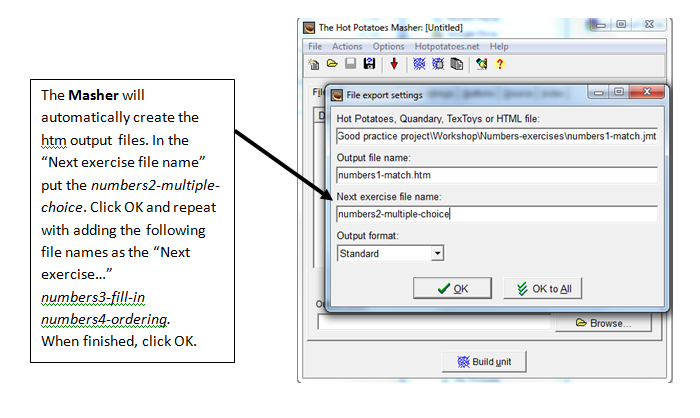 The software can be downloaded from the Hot Potatoes website where you can also find tutorials and further information. This section will guide you through the process of creating several types of exercises. The examples used here are very simple in order to provide you with a foundation. As you become more familiar with the software you will be able to explore many other functions and ways to use it. 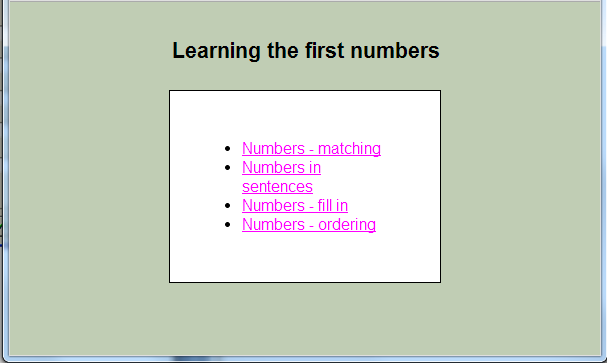 We will learn how to use Hot Potatoes by making a short set of exercises linked together to teach the numbers 1 to 5. Examples here are in English, but feel free to choose your own language! 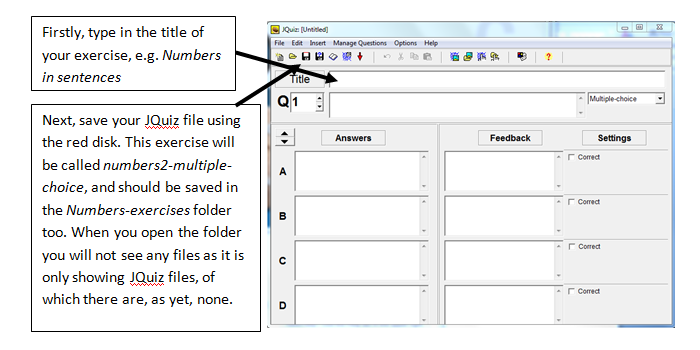 Before you begin work you will need to create a Folder somewhere on your computer called Numbers-exercises into which you will save your work. When creating a set of Hot Potatoes exercises it is important that all exercises and any associated pictures, sounds or videos making up a unit are contained in one folder. The front page of Hot Potatoes. The instructions in the following sections will guide you through creating four different exercises using the templates above and subsequently make them into a set using the Masher template. 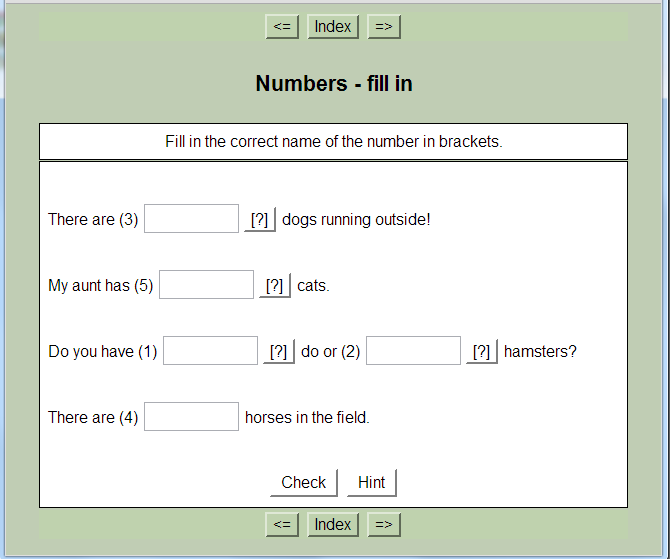 In this exercise the students will need to match the numbers 1 to 5 and their corresponding names (or words in the source and the target languages). From the Hot Potatoes front page open the JMatch application by double clicking the icon. That brings you to the JMatch front page. The front page of JMatch. First, insert the title of your first exercise into the title box. 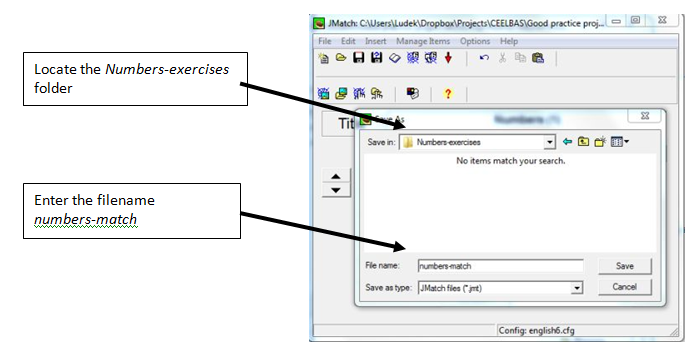 Next, you need to SAVE your first exercise into your Numbers-exercises folder. 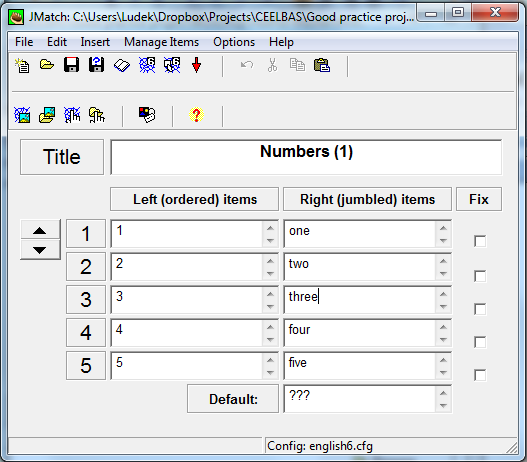 To do this click the red disk icon indicated above, and then save this first exercise as numbers1-match. It is helpful to call all exercises in a series by the same name with a different number or the type of exercise at the end. Now you are ready to create the exercise. We want to have the numbers on the left and the target language words jumbled on the right. Numbers left, jumbled items right. 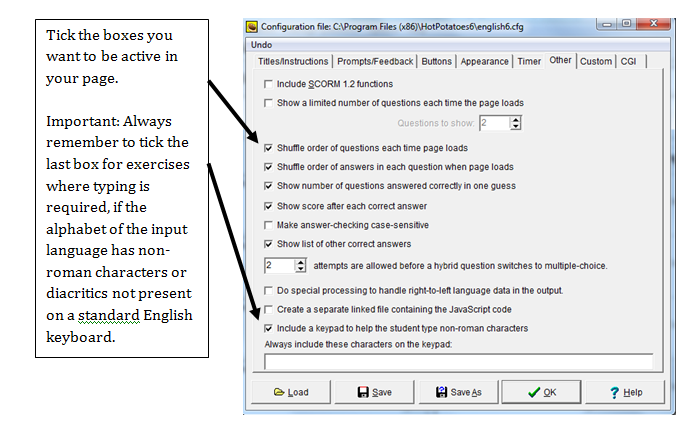 The next important stage is to configure the exercise, deciding how it will look to the student. 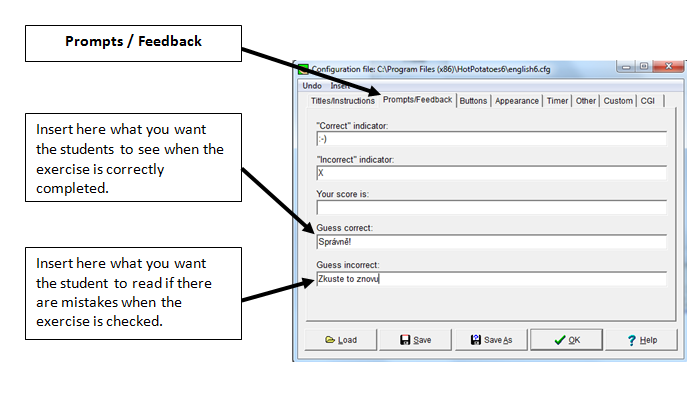 Click the Configuration button shown in the image below. There are several parts to the configuration section. Follow each of the instructions on the next pages to complete them. Work through each “tab”, and then press OK at the END. Enter a title and instructions. 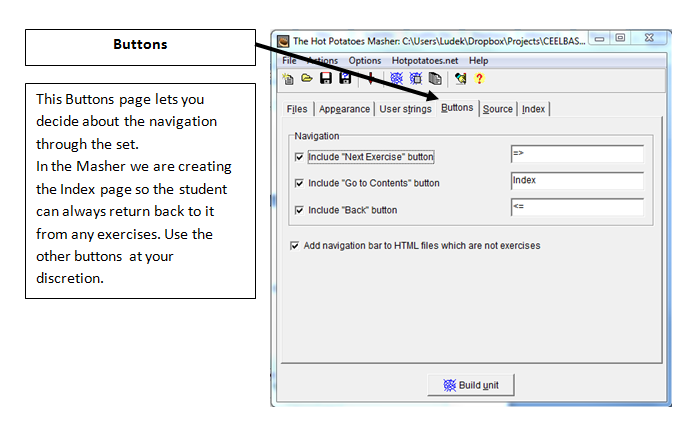 Only use the setting on the following two pictures if you are creating a stand-alone exercise or linking them to other exercises outside Hot Potatoes. You can change the captions for the buttons but leave the Next exercise blank. Once we have created all our exercises, we’ll use the Masher function where we’ll input the names of the files so we can leave this blank. However, if you don’t use the Masher, you’ll need to decide what file follows (or disable the Next exercise function by un-ticking it). The whole file name including the “.htm” must be added each time. 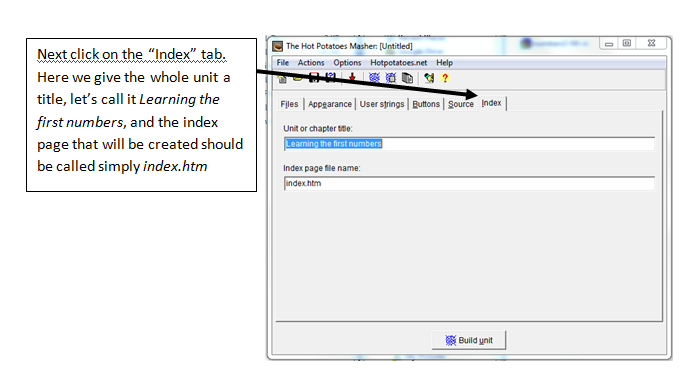 It tells the computer to look for an .htm file, which is the Internet format the exercises are saved in. The remaining three “tabs” do not apply to this exercise so you can ignore them. Click “OK” to complete your configuration. We will now SAVE the exercise twice. The first save will save the JMatch file with all the information you have entered. You will need this in case you want to make any alterations later. 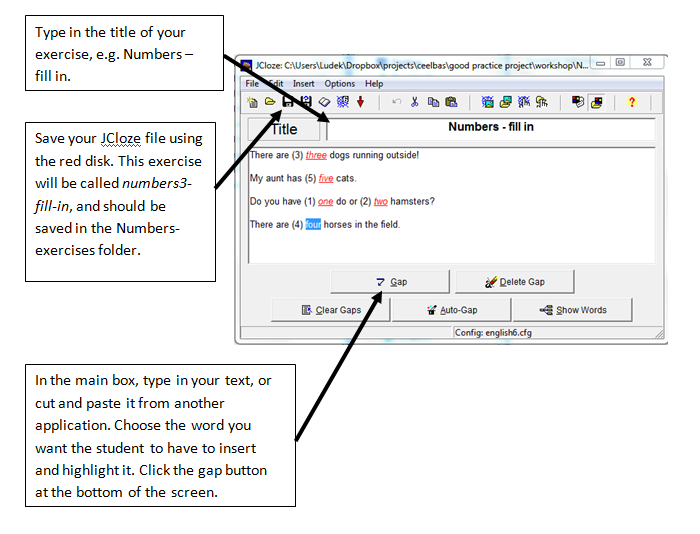 The second save will create and save the Web page that the student will see and use. 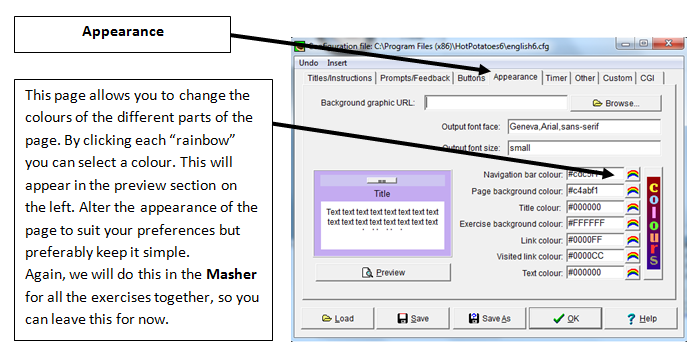 The Masher will later on convert our files to Web pages automatically, but let’s save it this time anyway to see our exercise. Hot Potatoes will tell you that it has created the file. 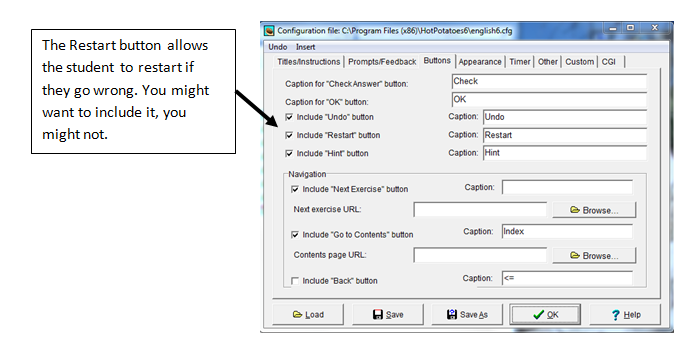 Tell it OK, then select “View the exercise in my browser” to see your exercise. 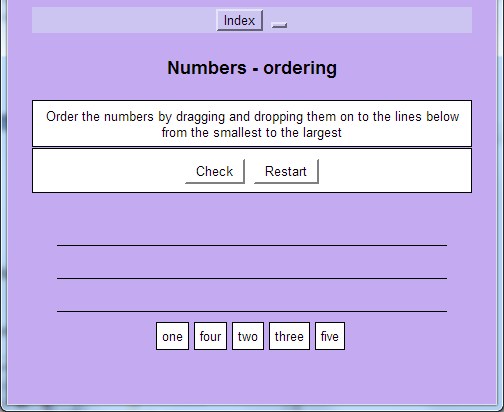 So now you have created your first interactive exercise using the Hot Potatoes Programme. The process may have seemed quite long, but the good news is that you have now covered most of the basics needed across all the Potatoes. Your browser cannot display the exercise on this page. 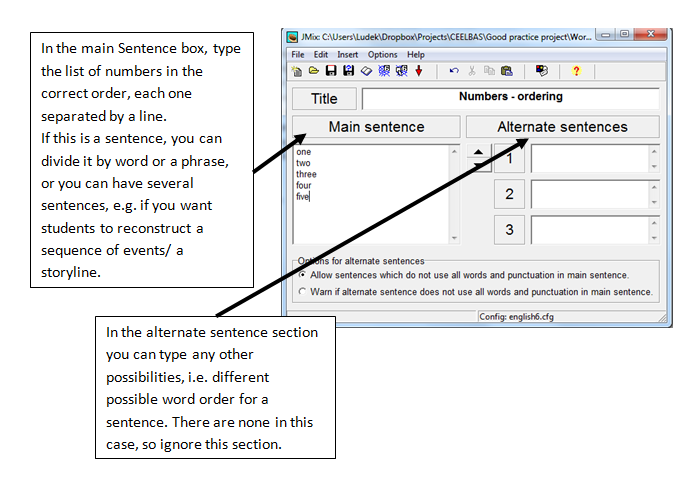 Click here to access the exercise on a seperate page. 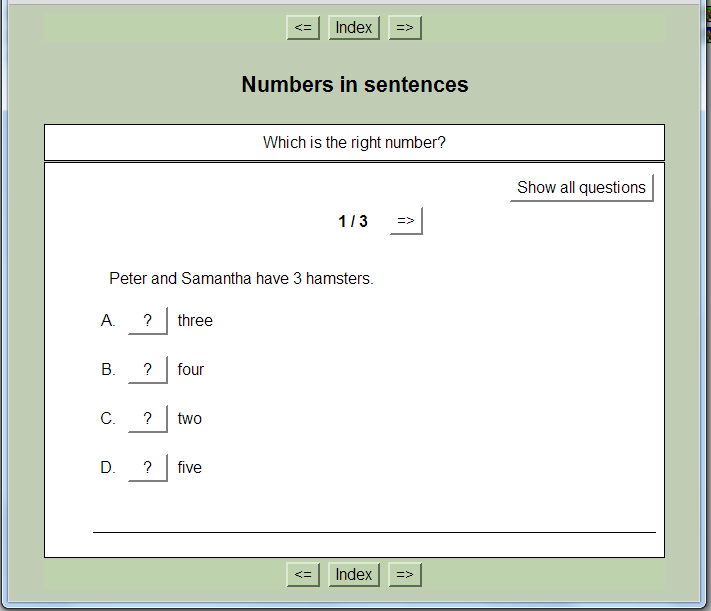 Next we are going to create a multiple-choice exercise where the students will have to identify and click the correct name of the number in the sentence. From the Hot Potatoes Front Page, click the JQuiz Potato. The front page of JQuiz. You are now ready to input the exercise. Enter the questions and answers. Once you have entered the exercise, you need to configure it, in the same way as before. Check back above if you need a reminder of how to do this. The screens to work through are essentially the same as in JMatch. The one extra screen you need to look at is the “Other” tab. Now you are ready to save the second exercise in your set. 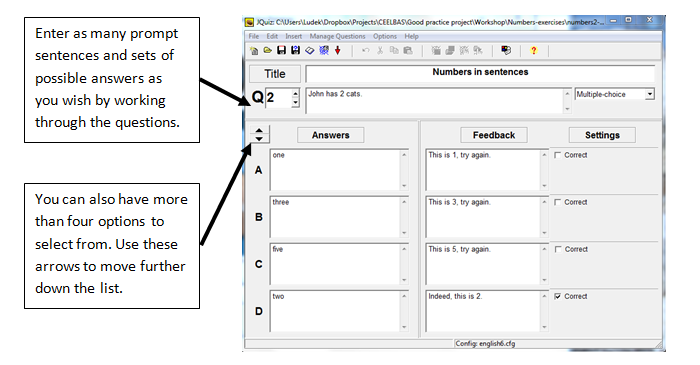 The next exercise in the set is going to be a gap fill exercise where the student will be required to type the name of the number shown in brackets into the gap in the sentence. From the Hot Potatoes front page open the JCloze potato. The front page of JCloze. Configuration time again. The exercise will be called numbers3-fill-in and the configuration will be the same as before. However, click on the Other tab for some important settings. Configuration via the "other" tab. Now you can save the exercise as before. Next, let’s have a look at the JMix potato. 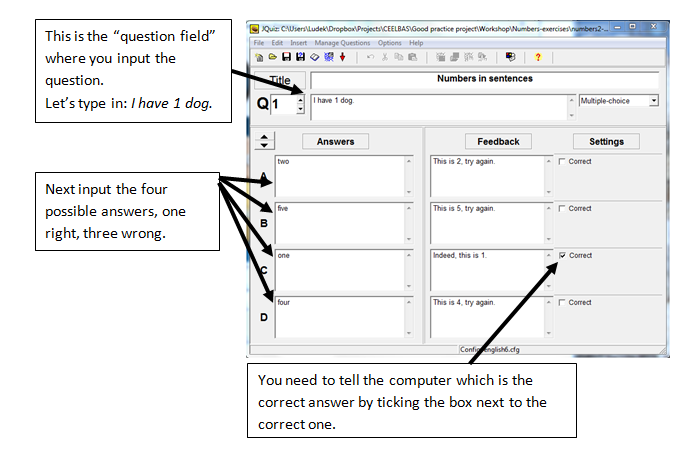 This allows us to create jumbled sentences or series of words, where the student has to put the parts of the sentence back into the correct order. Keeping it simple, we will use this potato to produce an exercise where the student has to put the 5 numbers in the correct order from the smallest to the largest. From the Hot Potatoes front page, open the JMix potato. The front page of JMix. Once completed you are ready to save the JMix file and you can save the Web page if you wish. 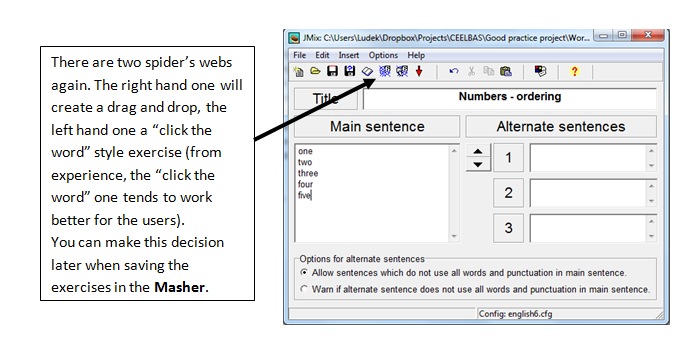 The completed exercise is shown below, drag and drop on the right, “click the word” on the left. 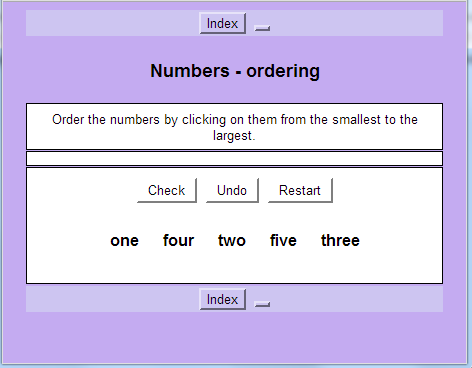 You have now created four exercises and the Masher will enable us to make an Index page with navigation through the exercises. 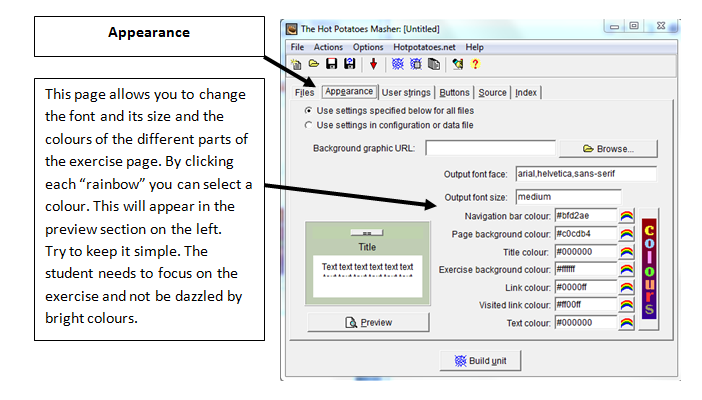 Open the Masher from the Hot Potatoes home page. The front page of the Masher. You can also add other html files. 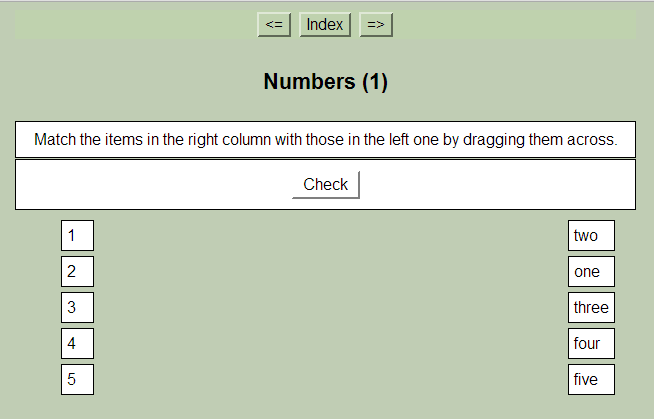 The Masher will include them in the sequence and add the navigation buttons to them as well. Adding exercises to the Masher. 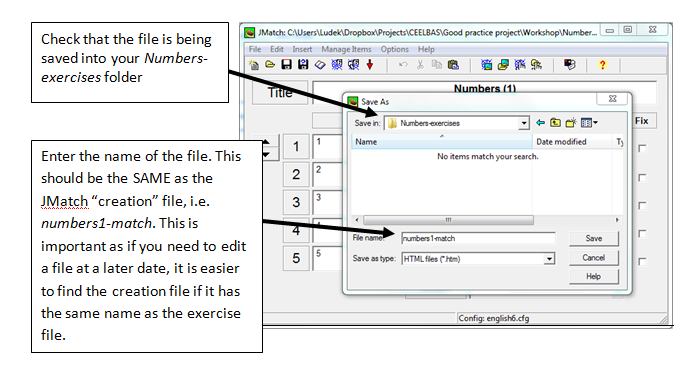 Now save the file in the usual way: click the red disc and call the file numbers-exercises-index. Let’s now customise the appearance and navigation. Give the index a name. Now you are ready to take the final step and build the unit. Click on the Build unit button at the bottom of the window. 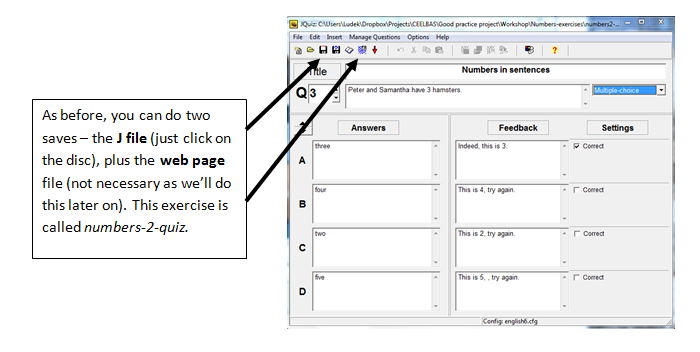 You can now click on the links and try out the navigation and go through your exercises!